Many of you may have heard about the study a couple of years ago refuting Disney's claim that Baby Einstein was "educational" for infants. It has been found that because watching television is such a passive activity, it really is not educational for babies, and in fact could be detrimental. 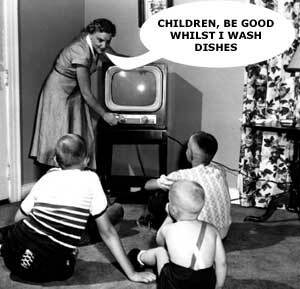 For that reason, the American Academy of Pediatrics recommends no TV viewing for children under 2. I was very good about following that recommendation with my little boy, but once he turned 2, I started feeling guilty for the amount of TV I let him watch. I was happy to find out that studies show that kids over 2 can actually benefit from watching a little bit of TV. In fact, exposure to shows such as Sesame Street, Dora, Blue's Clues, and Mister Rogers has been associated with pre-academic skills and long-term academic success. I would also add anecdotal evidence that the show, Yo Gabba Gabba, really helps kids (at least my little boy) develop some skills such as trying new things, persevering, sharing, etc. Use your judgment. Don't sit your toddler or pre-schooler in front of the TV all day, but an hour or two a day isn't going to hurt, and might even help! For a light hearted look at middle school, from both boy and girl perspectives, check out The Strange Case of Origami Yoda by Tom Angleberger. P.S. Tom gets points for having one of the coolest book covers and an awesome last name. Want to see knights in action? Stop by this Saturday, July 24, from 2-4 p.m. in the Community Room to watch the Knights of Veritas. 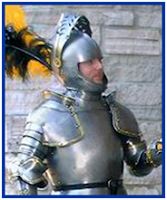 These Knights bring the medieval Age of Chivalry to life through interactive educational demonstrations of arms, armor, combat, knighthood and chivalry. It's history with a zing! Learn about the Code of Chivalry, as the Knights of Veritas pit myth against fact with thrilling demonstrations of historical combat technique! Their authentically weighted and detailed steel swords and armor provide an eye-opening experience. For those of you who signed up kids (0-18) for our Summer Reading program, don't forget to send in your entry form for the Dive Into Saving for College program. Three winners from each congressional district in Oregon will be chosen to win $1000 each to use towards the child's College Savings Plan. We have plenty of entry forms at the library and you can see more of the rules here. If you've read The Mixed Up Files of Mrs. Basil E. Frankweiler, you may have dreamed, as I did, I living in a museum and exploring after hours. Well, the Museum of Science and Industry in Chicago is looking for just that: a grown up who will live in the museum for a month, write about their experiences and do some other very cool stuff. Sounds like fun? Check out the official speak here. On a more local note, Oregon has introduced its own Reader's Choice Award for kids and teens, called ORCA and they desperately need a logo. Grand prize is $200 gift certificate to Powell's (and the winning design would be the new logo). Oregon residents aged 8-18 can send in their entries by August 13, 2010. Find out more on their webpage. Summer Reading Prizes Available Now! Kids and teens who signed up for the Summer Reading Program can begin picking up their prizes (including a free book, Oaks Park coupon and Blazers ticket) now! You have until July 31 to sign up for the program if you haven't yet, and August 31 to pick up prizes. Those of you planning to take your families to Oaks Park need to make sure to get your prizes before August 11, the WCCLS Oaks Park celebration day, or August 26, the alternate day for Washington County library patrons. For Percy Jackson fans who have devoured all of the books in the series, might I recommend a dose of non fiction books about mythology? A new(ish) series or Mythlopedia, if you will, offers four books with nothing but Greek mythology tidbits. Each covers a different topic of info, from Greek goddesses to mythological beasts. Great illustrations and an easy to read format makes this a fantastic way for kids and teens to find out more about all things related to the gods and goddesses of ancient Greece. 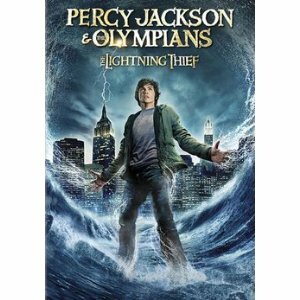 Calling all Percy Jackson fans!!! If you're going to be in the 4th grade or up and you love Percy Jackson as much as I do, come join us at Camp Half-Blood on Wednesday, July 14 from 3 to 6 in the Community Room. See the movie The Lightning Thief, enter a trivia contest, and find out who your "god parent" is. I already know who mine is: Athena. Go figure, I'm a librarian. We had so much fun with Re-Boot Camp last summer that we're bringing it back this year! This is a 2-day camp for 4th and 5th graders only. The kids will have fun at the library while learning computer and research skills. Last year, the first day several of the kids told me they were there because their parents made them go; the second day, the same kids said they were there because they wanted to be! The activities include a cyber-scavenger hunt for which prizes will be awarded. Call the Children's Desk at 503.718.2517 to register. There are two sessions to choose from: Tuesday and Wednesday, July 20 and 21, 2 to 3:30 PM, and Tuesday and Wednesday, August 10 and 11, 6 to 7:30 PM. Register for one session, but attend both days in that session. It will take place in the Technology Room upstairs. Seats are limited so that every kid can have his or her own computer. As some of you may know, this year's Summer Reading theme is Make a Splash, Read! In keeping with the theme (although kids certainly are not limited to books about water), comes the new series, Benjamin Pratt & the Keepers of the School, by Andrew Clements of Frindle and Jake Drake fame. The series gets off to a start with We the Children. Ben attends the Captain Oakes School in Edgeport, Massachusetts. The school was established in the 18th century by a sea captain, Duncan Oakes, and has remained ever since. But it is now in danger of being torn down and replaced by a water amusement park. Before cranky old janitor Keane is rushed away in an ambulance, he catches Ben and gives him a coin which reads "First and always my school belongs to the children, DEFEND IT, Duncan Oakes, 1783." He tells Ben not to trust any of the adults at the school, including the new assistant janitor. So it's up to Ben and his friend, Jill, to save the school. The question is: How? They have to follow a series of clues to figure it out. On top of that, he is also dealing with the separation of his parents and preparing for his upcoming sailboat race against his biggest rival, Robert. Will Ben and Jill be able to follow the clues and escape detection of this new, suspicious janitor? Will Ben beat Robert in the boat race? You know how to find out.